On Saturday, May 23rd, between 11am and 2pm, Brady's and Mike Farwell will be hosting a charity barbecue outside our store with all money raised going towards Cystic Fibrosis, and you can enter a draw to win a Broil King barbecue! British pies, now with Island Beef! Brady's is now carrying your favourite British beef pies, made with Natural Island Beef from Prince Edward Island! Read more about British pies, now with Island Beef! Kimchi (김치) now available at Brady's! Brady's is proud to start selling real Korean kimchi (김치) from the Aroma Café in Waterloo! Kimchi is a spicy Korean dish, made mainly from fermented cabbage (like German sauerkraut), vegetables, and seasonings. Brady's Kimchi is prepared by the Aroma Café in Waterloo. Read more about Kimchi (김치) now available at Brady's! Thanks! We won Platinum in the 2014 Record Reader Awards! Thanks to all our loyal customers who voted for us in the 2014 Record Reader awards! We won Platinum in the Favourite Butcher Shop category! Read more about Thanks! We won Platinum in the 2014 Record Reader Awards! Brady's is collecting cash donations to buy local potatoes for the Foodbank of Waterloo Region! Help us help others have a healthy Thanksgiving! Win prizes in the Brady's 15th Anniversary celebrations! 15 years ago, in October 1999, Brady's Meat & Deli opened our doors for the first time! We couldn't have reached this milestone without the support of our incredible, loyal customers, so during the month of October, we've partnered with our suppliers to give away birthday gifts to two lucky customers: a Broil King BBQ and an Apple iPad! Read more about Win prizes in the Brady's 15th Anniversary celebrations! 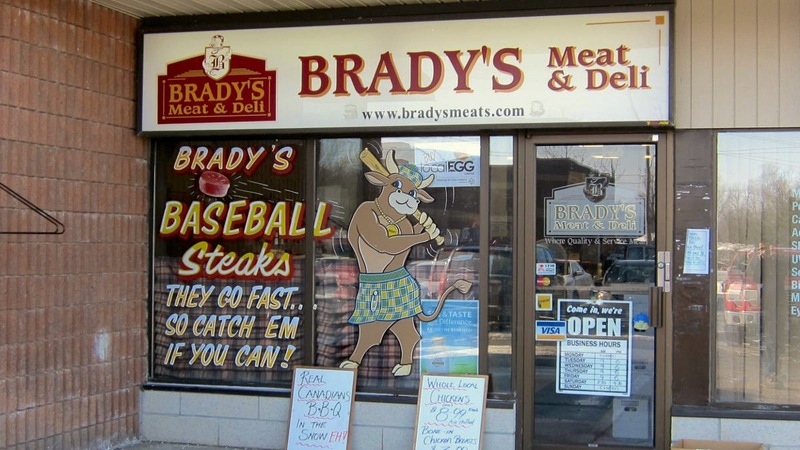 The Waterloo Region Record's 2014 Record Reader Awards are ready for voting, and Brady's has been nominated as one of the region's favourite butcher shops in the Food and Drink category! If you think that Brady's should be the region's favourite butcher shop, please vote for us now, and be sure to support your favourite local businesses as well! Voting is only open until this coming Sunday, October 5th, 2014! Pre-order your LiberTerre sliced spiral hams today! Pre-order your LiberTerre sliced spiral hams today and get a free LiberTerre insulated grocery bag (if you pick up your order between Oct. 1 and 12, 2014, while supplies last)! All LiberTerre hams are gluten-free, raised without antibiotics, and made with Canadian pork! Read more about Pre-order your LiberTerre sliced spiral hams today! Join Monica Place at the Canadian Clay and Glass Gallery for their third-annual Grape Escape fundraiser on October 2nd, 2014! The Grape Escape is an interactive food and wine pairing event, with all proceeds going to Monica Place: a local organization that provides professional support for single, pregnant women, young parents and their children through residential supported housing and community programs.